Somewhere towards the end of January I get cravings for a curry. Something spicy and a complete contrast to the food we tend to eat over the holiday period, with ham or turkey as the centrepiece. As a change from the usual roast lamb with mint sauce, try this Indian-style spicy roast lamb. Serve the lamb with vegetables or skip the vegetables and serve it in wraps. Good for casual entertaining or teenage kids, where you can let everyone fill their own. When it’s first made the coriander chutney is bright green. I made mine ahead and the colour changed, so it’s not so pretty in the photo. Make slashes with a sharp knife all over the lamb. Place in a roasting pan. Place first 5 ingredients for Spicy Marinade in a small frying pan and stir over moderate heat until the spices smell fragrant. Place in a bowl, add remaining marinade ingredients and mix well. Spread all over the meat and rub in well. Leave lamb to marinate for a few hours at room temperature or loosely covered in the fridge overnight. Pre-heat oven to 180°C. Cover lamb with foil and roast for an hour and a half. Remove foil and roast for a further 30 minutes or until done to your liking. Remove from the oven and leave to rest, loosely covered with foil, for about 15 minutes, then carve thinly. Place all ingredients for Coriander Chutney in food processor and process till chunky-smooth, stopping halfway to scrape down the sides. Add water if it’s too thick. Serve lamb garnished with with coriander sprigs and lemon wedges with vegetables of your choice and the chutney. Or serve it in warm wraps with the chutney and some extra plain yoghurt and maybe some shredded lettuce or rocket. 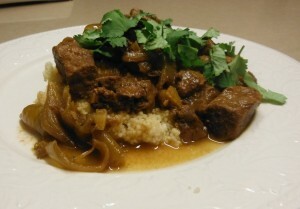 Our friend Juliette recently posted a recipe for Slow Cooked Sticky Asian Lamb on Facebook. It looked delicious so I saved it. 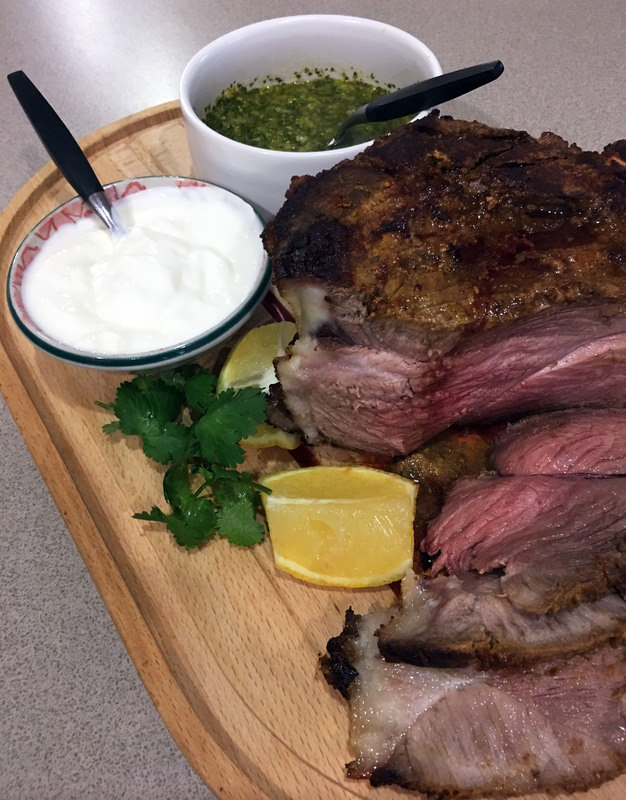 The recipe uses a whole leg of lamb, but the other day I was in the supermarket when they decided to mark down all their one kilo packs of forequarter lamb chops to $2 a packet. I couldn’t resist buying a few for the freezer as they were almost giving them away. I decided to make the Sticky Lamb using 2 kilos of chops instead of a leg. 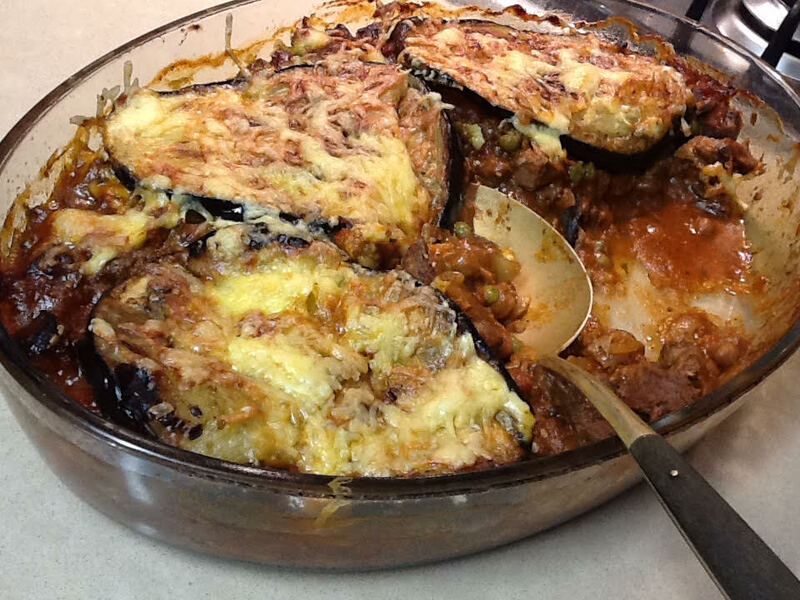 It was delicious and would makes a great dish for a large family or casual entertaining. Trim meat, discarding any fat which is easy to remove. Heat oil in a large frying pan and fry meat all over until nicely browned and caramelised. If using chops you will need to do them in 2-3 batches. Place in slow cooker. Mix all ingredients for the sauce and pour over the meat. If you’re using chops rather than a leg of lamb you will need to add a bit more liquid, so add a cup of water. Cover and cook for 5 to 6 hours on High. Every couple of hours turn meat over to make sure it’s well-covered with the sauce. Remove meat from slow cooker when it’s very tender and falling off the bones. Using two forks shred the meat, discarding bones and lemongrass. If there’s a lot of fat in the sauce, put it in the freezer until the fat sets on top and can be easily removed and discarded. Place sauce in a small saucepan and boil to reduce a bit. You want a thickish sticky sauce, but don’t over-do it or you will end up with too little. I didn’t need to reduce my sauce, but this will depend on your slow cooker because they vary a lot in temperature. I shredded the meat and put it back into the sauce in the slow cooker and left it there on Low for an hour, until I was ready to serve. 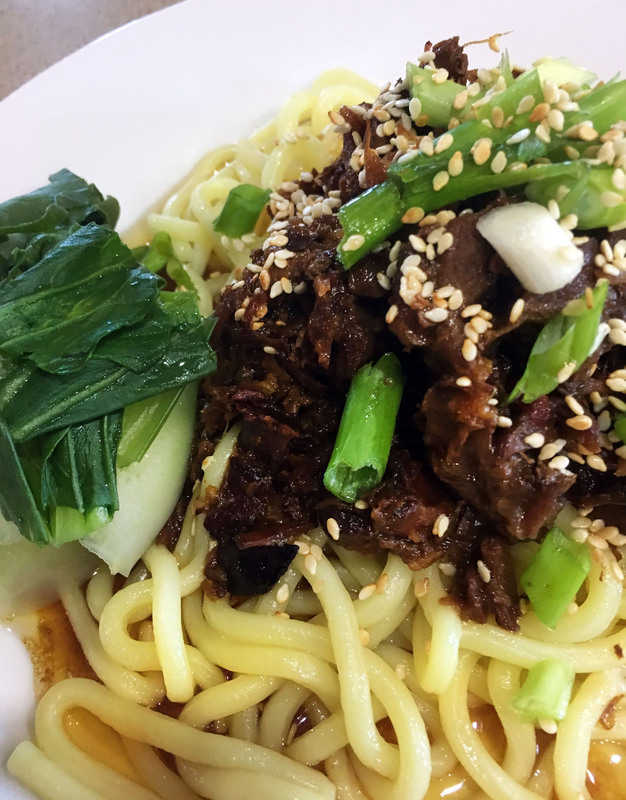 Cook noodles according to packet instructions, drain, season and add the sesame oil. Pile noodles onto a large serving platter or divide among individual plates. Top with the meat and sauce then garnish with sesame seeds and spring onions. Serve steamed greens in another dish and let people help themselves. This Moroccan-style casserole makes a delicious mid-week family dinner. If you have more time to cook at the weekend, it will keep in the fridge for 3-4 days and the flavour actually improves with keeping. Or you can double the recipe and freeze half. If you don’t have any ground cloves just leave them out. The preserved lemon gives a very distinct flavour and is worth getting. You can buy them in specialty shops or make your own from this recipe for preserved Kumquats – just use lemons instead. They keep for months, even years, without refrigeration. Couscous is a quick and easy accompaniment to serve with this casserole. Place a cup of dry couscous in a bowl and add a cup of boiling water or stock. Stir then cover and leave for 2-3 minutes to swell up. Fluff up with a fork, season to taste and voila, it’s ready to serve. Heat oil in a large non-stick frying pan or a heavy-bottomed saucepan. Add onion and garlic and cook, stirring for 2-3 mins until softening but not brown. Add the meat and continue to cook over moderately high heat until the meat has browned. Add all the spices and continue to cook, stirring, for 1-2 mins. Add remaining ingredients and season to taste. Simmer for 15-30 mins or until meat is tender, adding a little water if necessary. 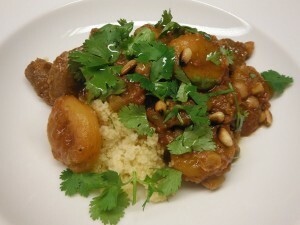 Serve with couscous and garnished with the coriander and pine nuts. Variations: use raisins, dates, prunes or figs instead of apricots. Use parsley instead of coriander, toasted slivered almonds instead of pine nuts and serve with rice or mashed potatoes instead of couscous. Moroccans make their casseroles in earthenware cooking dishes with domed lids called tajines. So the word “tajine” is used to refer to both the cooking pot and the casserole you make in it. Recipes often combine meat or poultry with dried or fresh fruit and sometimes include some honey and a few nuts. We planted a quince tree about three years ago and recently picked our first quinces. Just two. So I decided to use them in a Moroccan lamb and quince casserole. Instead of using my traditional cooking pot, which I bought when we were holidaying in Marrakesh, I made it in my slow cooker. Fresh or frozen pomegranate seeds add a nice splash of colour, but they’re not essential. They freeze well – so stash some away when they’re in season. A little goes a long way as a garnish. I made a large stacking ring by removing the top and bottom from a 425g can of tuna and used it to arrange the couscous in the centre of the plate with the lamb on top. Heat oil in a large frying pan and brown meat on both sides in two or three batches. Remove meat and place in slow cooker. Add garlic and onion to pan and cook gently, stirring, for 5-10 mins or until softened. Add the five dry spices and cook for one minute, stirring. Add the spice and onion mixture to the slow cooker with the quinces, honey, stock, lime leaves and fish sauce. Cover and cook on High for 5-6 hours (or on Low for 8-10 hours), adding the sweet potato and chickpeas about halfway through the cooking time. Slow cookers vary, so you will have to adjust the cooking time as you go. If possible check and stir the tajine every hour or so. 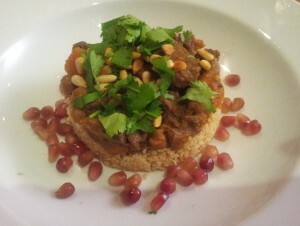 Serve tajine on a bed of couscous, garnished with chopped coriander, pine nuts and pomegranate seeds. Note: if preferred, cook the casserole in a heavy casserole dish with a lid in the oven at 170°C for about two hours, adding the sweet potato and chickpeas about halfway through. 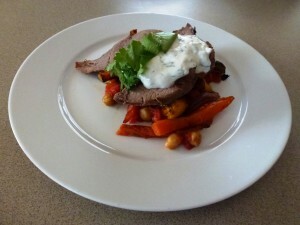 This Greek-style roast lamb is very similar to a recipe I posted a couple of weeks ago. This one is accompanied by a rocket salad rather than roasted vegetables, making it a more summery dish. On one large platter it makes a good addition to a casual buffet. Preheat oven to 170°C. Trim excess fat from lamb. In food processor or using a mortar and pestle, make a paste with the salt, garlic, peppercorns, rosemary, oregano and olive oil. Place lamb in a roasting pan and spread it on both sides with the herby paste, massaging it in. Add vinegar or lemon juice, water and wine or sherry to the bottom of the pan and cover with foil. Bake for an hour, then turn the meat over and baste with pan juices. Cover again with the foil and return to the oven for another hour or until the meat is very tender and almost falling apart. Remove foil, turn the meat over again and turn the oven up to 200°C. Cook for a further 20 minutes, or until browned on top. Prepare a large serving dish or individual plates with a simple rocket salad, dressed with lemon juice and olive oil. 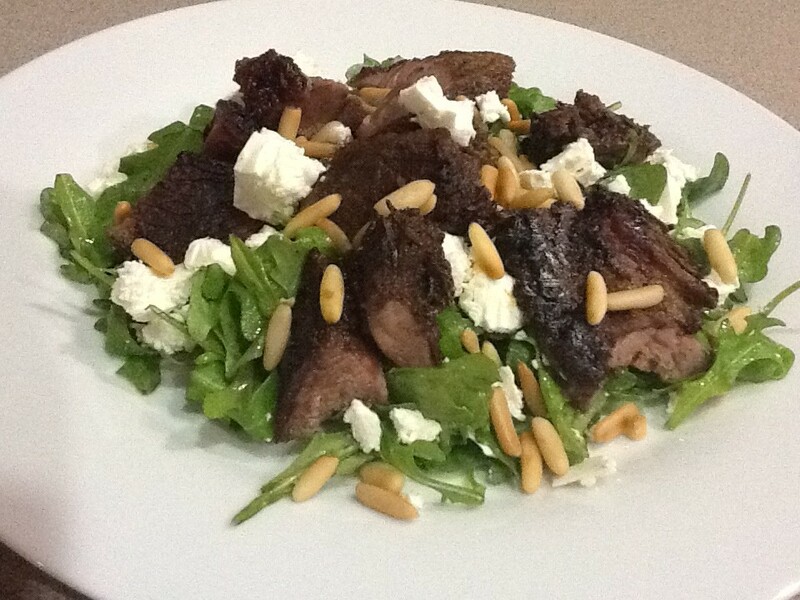 When the lamb is ready break it into pieces using two forks or cut it into pieces and arrange over the salad. Sprinkle with feta or goat’s cheese and toasted pine nuts. If liked, drizzle with some of the juices from the roasting pan. Serve with warm pitta or Turkish bread. I haven’t cooked a shoulder of lamb for some time, but we ordered one recently in a restaurant, to share between four, and it was delicious. When I saw them for only $7.99 a kilo at a local butcher’s this week I bought one. A roast is perfect to serve in summer or winter because you can adjust the accompaniments to suit the weather. Oven-roasted vegetables served hot in winter or at room temperature in summer. A tabouleh, lentil or couscous salad or my Spinach Salad with Red Dressing are all good side dishes in summer. As the lamb was roasting delicious smells wafted through the house. Our golden retriever Danske and our son’s chocolate lab Hershey, who was staying with us for the weekend, twitched their noses appreciatively each time they stirred from dozing. Lamb cooked this way is moist with a delicious lemony-herby flavour. The outsides which have been in contact with the pan are chewy and slightly crispy. Very moreish. 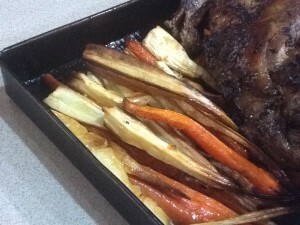 I served it with oven-roasted parsnips and carrots, with a drizzle of honey. The dogs had some of the pan juices from the lamb mixed with their biscuits for breakfast, which caused much excitement and tail-wagging. Preheat oven to 140°C. Place remaining ingredients except wine in a food processor or mortar and pestle and crush to a paste. Smother the lamb with this paste then place in a deep roasting pan, pour in the wine and cover with foil. Roast for 5-6 hours, or until lamb is very tender and falling off the bone. Ovens vary, so if the meat is ready but not brown enough, remove foil, turn oven up to 200ºC and put the meat back for about half an hour – you want some nice brown crispy bits. Serve with vegetables or salad. Variations: use mint and oregano instead of rosemary. Oven-roasted parsnips and carrots – peel 4 parsnips and quarter lengthwise. Peel (if necessary) 4-6 carrots and quarter or halve lengthwise depending on size. Place in a roasting pan, in a single layer. Drizzle with a little olive oil and roast for 30-40 minutes at 180°C. If you’re cooking them with the lamb at 140°C they will take longer – between an hour and an hour and a half. Turn and baste from time to time. Season to taste with salt and pepper and drizzle with a little honey. I started making this Moroccan lamb when we were living in Paris. I served it when my Dad came over from the UK with the rest of my family to celebrate his 80th birthday. The recipe has evolved over the years and has become a family favourite. Our eldest son James makes it so regularly and it has become his signature dish. Butterfly the lamb to a fairly consistent thickness and place in a glass or pyrex dish. Butterflying just involves a couple of cuts through the very thick parts to open them out a bit. You will still have some thinner and some thicker parts, so some meat will be less well cooked than others – something to suit all tastes. Combine remaining ingredients and spread over both sides of lamb. Cover and leave to marinate for up to 6 hours, in the fridge. Preheat oven to 200°C and bake lamb, uncovered, for 40-60 minutes, depending on the weight of the meat and how well done you like it. Best to use a meat thermometer. Cover loosely with foil and leave to rest for 10 minutes. Carve thinly and serve on a bed of Moroccan vegetables, garnished with a dollop of Mint Yoghurt. If liked drizzle some pan juices around the plate. A couscous dish on the side goes well. Moroccan vegetables: when the oven roasted vegetables are almost ready, add the chick peas, tomatoes and cumin and return to the oven for about 10 minutes or until heated through. Mint Yoghurt: mix yoghurt with remaining ingredients and refrigerate until serving time. Note: if preferred cook the lamb on a BBQ. One of my favourite places to lunch with friends is at the Palette Cafe, located in the Beaver Galleries in Deakin. They are not open in the evening and are closed on Mondays. In the warmer months my favourite dish was the avocado and smoked salmon salad served on a spicy gazpacho-style tomato sauce. It’s so good, I can’t tell you how many times I’ve ordered it! One of my friends always has the brains with crispy bacon, which she says are to die for. I have been there umpteen times and never had a bad meal. We went there for Mother’s Day brunch and it was excellent. Anyone who can make scrambled or poached eggs which are as good as the ones you make yourself wins my vote. Hats off chef, Meaghan Pidd. I recently ate one of Meaghan’s delicious lamb pies, served on a bed of sauteed mushrooms, so I decided to make something similar. Eight pies might be too many but you could do as I did – bake four and freeze the rest, then just make half the mushroom mixture. 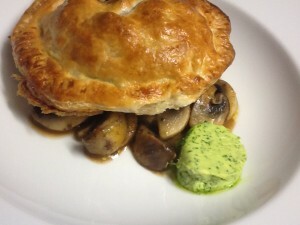 While meat pies are not for those trying to cut down on cholesterol, on a cold winter’s day they just hit the spot! Heat oil and butter in a large heavy-based pan and add the onion and garlic. Cook gently, stirring often, until soft but not browned. Cut the meat into 2cm cubes and add to the pan. Turn up the heat and cook, stirring continuously, until the meat starts to brown. Add the brandy and continue to stir as it evaporates. Add remaining ingredients apart from cornflour mixture. Simmer until meat is tender. This will depend on the meat, but shouldn’t take long. If there’s not enough liquid, add a dash of water. When meat is tender add cornflour mixture, stirring until the sauce thickens. Cool, then refrigerate several hours or overnight. Cut sixteen circles of pastry about 15cm in diameter using a saucer or bowl to cut around. You may only get one per sheet of pastry, then you will need to gather the trimmings, re-roll and cut the rest. Divide meat filling amongst 8 of the circles, leaving 2cm around the edge. The gravy will have thickened, so it can all be used. Dampen edges of pastry circles, place another circle on top. The tops will seem too small, but if you go round squeezing the edges together they will stretch to fit. You will end up with 8 flying saucer shaped pies. Invert them onto a baking tray lined with baking paper. They can be refrigerated at this stage for up to 24 hours, covered, or frozen for up to a month. Preheat oven to 180°C. Thaw pies if frozen. Brush with beaten egg. Bake for 30 minutes or until golden brown. Serve on a bed of mushrooms with a slice of herb butter on the side. Mushrooms: wipe mushrooms and cut into quarters, or eighths if they are larger. Heat butter in a non-stick frying pan and cook mushrooms, stirring, until slightly softened. Add sherry and mustard. Cook for a minute or two to evaporate some of the liquid, then season to taste. Herb Butter: place herbs in food processor and chop very finely. Add butter, garlic and salt and process to mix well. Scrape out onto a piece of plastic wrap. Use the plastic to form butter into a small log about 2cm in diameter, wrap in the plastic wrap and refrigerate for several hours or overnight. It will keep for two weeks in the fridge.